Dear honored trustees and members of the Ernst von Siemens Music Foundation, dear Professor Kaiser, I am simply overwhelmed by the honor and recognition that you have conferred upon me. When I learned that I was to receive the Ernst von Siemens Music Prize, I felt ashamed. I was ashamed, honorable Sofia Gubaidulina, because I was to receive this exalted, globally recognized prize from you. A feel deeply honored by your presence here this evening. Your concert on Monday in the Allerheilige Hofkirche was a glorious moment. And my admiration for the great composers goes hand in had with my admiration for the interpreter Sofia Gubaidulina. To see my favorite composers here today is a special honor that gives me great joy. I can hardly believe my eyes as I look around this hall. Only in my fondest dreams could I ever have imagined to see wonderful Maître Henri Dutilleux seated next to Sofia Gubaidulina. Très cher Henri, je suis très fière et éternellement reconnaissante que vous soyez venu spécialement de Paris pour être avec moi. Je vous admire depuis la première note que j’ai entendue de vous. It is also with great pleasure to see another great Wolfgang, after Wolfgang Amadeus, namely Wolfgang Rihm. I also thank you from the bottom of my heart for honoring me with your presence. And here straight from New York are André Previn and Sebastian Currier. André, you dedicated one of the most beautiful violin concertos to me. My movement, the third, based on a popular children’s song, is always a trip in time through my childhood. Sebastian, I can’t wait to premiere the concerto Time Machine that you wrote following your inspiring Aftersong, which we will hear tonight. Dear members of the curatorium and foundation council, your award fills me with pride and joy as no other award before it has. And as if the Ernst von Siemens Music Prize did not bring me enough joy, you, my dear Professor Kaiser, have honored be with your poetic words. In view of your outstanding linguistic talent, I will not even dare to attempt to express my thanks in words. Because I am certain, my dear ladies and gentlemen, that the voice of my violin will bring you greater pleasure. But first I would like the share with you my thoughts on the necessity for privately sponsoring the arts. It now appears pointless to complain about the lack of political support for the arts when it comes to dividing up the public financial pie. The focus of public funding is now on basic necessities, and there does not seem to be much left for allegedly peripheral projects. What remains is hope. The hope that we can establish a bridge, which at first glance perhaps appears to be self-contradictory, namely bridge between the worlds of business and private sponsorship and the world of culture. In 1935 the unforgettable Paul Sacher wrote the following words in his essay "Culture and Crisis". I quote: "Because engaging in any form of the arts requires a certain material basis, and, for example, because composing and performing music always cost more than the amount of money they generate, the inherent affinity between the art and crisis is self-evident." The economic crisis of the thirties, which formed the background against which Paul Sacher wrote these words, has fortunately long past. But the necessity for providing a material basis for all forms the arts transcends all economic ups and downs. Musicians have long not been satisfied with simply eking out a living through the performance of their art. Much more important is that they be afforded dignity and artistic freedom. This is especially true for composers – even when they enjoy the highest degree of recognition and fame. Two examples: Karlheinz Stockhausen, the 1986 recipient of the Ernst von Siemens Music Prize, said in accepting the award: "When I received the letter from Dr. Sacher … I was thankful and greatly relieved. Over the last few years, as the result of artistic recklessness, I spent much more money than I possessed for printing my scores and for the royalties, which the ‘new team’ at Deutsche Grammophon demanded that I pay to performers and broadcasters for the release of the recordings of my works. And Wolfgang Rihm, for whom my respect has no limits, said here in 2003: "A composer lives from day to day. When be begins to compose, a composer must either have received an inheritance, which is not my case, or he must pay an enormous amount money out of his own pocket. I am therefore thankful that I finally have a means to pay off my debts." Ladies and gentlemen, the two composers I mention here are only the tip of the iceberg. Without support, whether through prizes, stipends or commissions, the majority of avant-garde musical creations would simply not exist! My dear honored trustees and members of the Music von Siemens Foundation, as a performer I am dependent upon the work of composers. I have thus long felt a deep debt of gratitude to them and them alone for their exemplary and courageous support for contemporary music. The public has rarely conferred upon these prize winners the respect that they deserve. I would therefore like to again draw attention to the distribution of prize money between the music and support prizes. Ninety-one percent of this year’s total prize money has been allocated to the support prizes, and it comes to the proud sum of 2.1 million euros. This amount has been steadily growing for some time. The Ernst von Siemens Music Foundation is thereby not only rewarding the tip of the iceberg but is lending exemplary support to the education and training of young artists. For this reason I feel deeply indebted to you! The urgent need for supporting talented young artists is something that I experienced myself while growing up. I know how difficult it is get the necessary support during these important formative years. I had the good fortune of working together with great musicians during my early years. Thanks to them I was able to grow as an artist. I have very fond memories of my wonderful mentor Aida Stucki. She remains a guiding star for me today, and we remain very close friends. And I had a tremendous opportunity to be allowed to audition before Herbert von Karajan. And then there is Paul Sacher, who was a tremendous supporter and patron during my early years and who helped me develop my passion for modern music. The premiere of Witold Lutoslawski’s Chain II, which he directed in 1986 in Zurich, was the beginning of a new era for me. It opened my ears to an entire new universe and has made my life as a musician much richer than it would have been if I had only focused on the existing repertoire. Every premiere is the equivalent of an artistic rebirth. Every new work poses new questions, has its owns limits of understanding and its own technical demands. But every new work is a living dialogue with the composer. And I admit that during such conversations I very rarely have an opportunity to express my own point of view. In all of the years of my youth there was only one work that I could not relate to, namely Berg’s "To the Memory of an Angel." He dedicated it to the daughter of Alma Mahler, who died of polio at an early age. It requires a real birth – that of my daughter and later my son – and the ecstasy connected with it to make the deep despair over the loss of child comprehensible. And thus every premiere, every moment of happiness in my life as well as the difficult days of my Seelenlandschaft would become increasingly more similar to a picture by Mark Tobey. His paintings, with their very beautiful Japanese ceramic tiles with all of their cracks, appeared to be a likeness of my increasingly more porous soul. Perhaps this maturization process made me a better musician – deeper and more precise in one respect but freer in another. In past years I have attempted to pass on to the next generation at least a little of the happiness that I experienced very early on. This is possible only with collective support – especially in view of the financial dimensions involved. 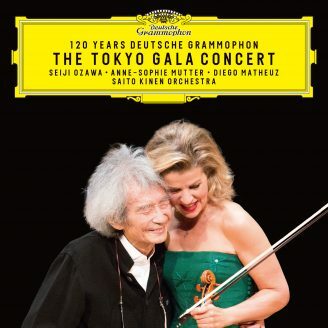 For this reason the Anne-Sophie Mutter Circle of Friends Foundation was founded 11 years ago. In order to increase the level of support, a foundation parallel to the Circle of Friends is now being established. I will now allocate the 100,000 euros that comes with the Ernst von Siemens Music Prize to this foundation. Ladies and gentlemen, I cordially invite you all to contribute your support. Because we can succeed only when we all take an active role in supporting talented young artists. This is a tremendous challenge for all of us who care deeply about the future of music. In order to help them I also need your help. Please lend us a hand so that every extraordinarily talented musician has an opportunity to open a window to a higher dimension for all of us. We support young musicians financially by helping them obtain suitable instruments, by granting them scholarships and by arranging instruction from renowned musicians or auditions before outstanding directors. We are thereby pursuing a very new and, to the best of my knowledge, a very unique course in that we are commissioning composers to compose works for us. We are expanding the repertoire for these scholarship holders while at the same time deepening their interpretive capacity. It was Roman Patkoló, a talented contrabassist, who was responsible for launching us on this course. Virtually no soloist repertoire existed for his instrument – until April 14th of last year. It was on this day that the Double Concerto for Violin, Contrabass and Orchestra premiered in Boston. This enchanting work was composed by Sir André Previn at the behest of the Circle of Friends Foundation. More contracted compositions are now being composed. For example, Kristof Penderetzki is currently writing a composition for violin and contrabass, and Wolfgang Rihm is composing works for Roman and me. Ladies and gentlemen, honored trustees and members of the Ernst von Siemens Music Foundation. Because music says more than a thousand words, it is now time for us to enjoy that which brings us all here in the first place – namely music, with which I would like to thank you all from the bottom of my heart. Although you are rewarding me today for what I have accomplished in the past, I view today above all as constant future challenge. You will now hear Mikhail Ovrutsky accompanied on the piano by Ayami Ikeba. Mikhail is also a Circle of Friends scholarship holder. In addition to performing as a soloist, he is employed by the Beethoven Orchestra in Bonn as first concert-master and by the Cologne University of Music as a lecturer. He is a fantastic violinist who has performed Bach’s Double Violin Concerto in many European countries. Afterward Roman Patkoló and I will play the cadenza from the Double Concerto for Violin, Contrabass and Orchestra by Sir André Previn. For me the high point of the evening will be André Previn’s improvisational artistry on the piano. There is nothing that gives me more pleasure, my dear André, than listening to you improvise. I like to listen most of all to celebrated American theater music reinterpreted by you.